Since Avatar’s success in 2009, critics have annually taken the chance to declare that 3D cinema is dead, dying or at least retreating into a coma. Each year, a 3D film comes along (Cave of Forgotten Dreams (2010), Hugo (2011), Life of Pi (2012)) that excites the press and provides counter claims that 3D cinema may be worth hanging onto for at least a little bit longer. Although The Great Gatsby looked as if it were to be the 3D film of 2013, mixed reviews meant that it was quickly usurped by the hype for Gravity. Even before the film’s release, director Alfonso Cuaròn was praised for conceiving and designing the film in spectacular and stunning stereoscopy. Sneak previews at the film’s 3D led many figures in the industry to claim it was the best use of 3D they had seen. When released it took a substantial $50 million+ at the box office and gained 80% of that revenue from 3D ticket sales, reversing a recent trend in the US for 3D films to take more money on 2D than 3D screens. At the time of writing Gravity has an impressive 97% rating on Rotten Tomatoes, and various critics have taken to Twitter to highlight their repeat returns to the cinema to see it again. There have, of course, been some minor controversies: astrophysicists have claimed many of the scientific details in this film’s space drama are incorrect and it has been criticised for a lack of dramatic development. Nonetheless, many others are expecting the film to be in the same Oscar-winning territory as Life of Pi. It is also very much a film that needs to be seen in a large cinema auditorium. The first sighting of the Hubble Telescope that astronaut Matt Kowalski and medical engineer Ryan Stone are working on occurs with the craft appearing far away, delicately small in the upper left area of the screen space. It comes closer and closer to the audience, aided by stereoscopic depth cues that help pinpoint its movement in space. This shot, and others shots in which astronauts take up very small amounts of the screen space, begs the question as to what would be visible were the film to be watched on a small screen. For me, the most significant achievement of Gravity was its ability to finally produce a three-dimensional soundscape that was as vivid as its three-dimensional visual field. Stereo sound has long played an important role in film technology yet, even with recent 7.1 surround sound, the frontal action on the screen often directs sound in fairly conservative ways. I watched Gravity in the Embassy Theatre in Wellington where the soundscape played through Dolby Atmos. Within its opening sequence surround sound was used to bounce conversations between Mission Control and astronauts around the auditorium. The dynamic and ever changing sound field reflects the unstable, free-floating movement of the astronauts. No centre-point is presented in the mise-en-scène and the lack of fixed, directional sound, coupled with a 3D visual field that eliminates the plane of the screen, means that the lack of gravity in the film is continuously re-presented. 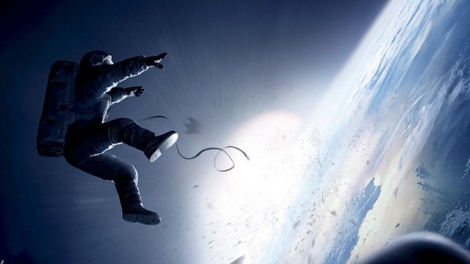 As Cuarón states “The intention was that you would be a third character, floating with our heroes.” While a number of recent action blockbusters have used fluid camera movements and fast editing to disrupt the perspective based, secure viewpoint traditionally found in classical cinema (see Matias Stork’s essay on chaos cinema for a good break-down of this process), Gravity seems unique in its use of long takes and crystal clear shots in order to provide a sense of unhinged and unstable space. The unstable space means that there is potential to move objects in front of and behind the traditional plane of the screen without drawing too much attention to the violation of the screen barrier that separate audience from film in 2D cinema. Objects seem to ebb and flow between positive and negative parallax space so that it is impossible to talk about the 3D effect as ‘popping out’ the screen as is so often the case in discussion of 3D cinema. Within this context the depth budget in front of the screen is not particularly large but there are some striking moments when negative parallax is used to engage audiences in the action. Towards the beginning of the film, a bolt escapes from the part of the spacecraft that Stone works on. Just before it seems as if it will reach the audience, Kowalski reaches out a hand to grab it. As his hand stretched out towards viewers, the shot is reminiscent of Dial M for Murder’s (1954) most famous shot during which Margot reaches behind her to try to grasp a set of scissors. A similar shot set up is used later in the film when Stone and Kowalski grasp at each other’s hands. Their arms produce a direct channel between negative and positive parallax space, suggesting the audience might also be able to traverse into a filmic place normally occupied only by the characters. There is also a dynamic emphasis on the use of positive parallax to the extent that it creates visual images of space and Earth that would not normally occur. Even though Earth is situated at a distance that is far beyond the scope of stereoscopic depth perception (if, for example, you look at mountains in the distance you will see that you can no longer perceive stereoscopic depth cues) Earth is given contoured surfaces. While not scientifically accurate, this depiction of a dynamic visual field capture’s the viewer’s attention and reminds us why we are so fascinated by vistas seen from space. There are some other stunning moments when stereoscopy enhances the visual field. At one point Stone struggles to breathe and, as she is gasping for air, her face is framed within a tight close up. We seem to be uncomfortably close to her face and can see detailed contours and textures on her skin and features, making the asphyxiation more intense. As is increasingly common in 3D films, underwater shots are utilised. When the landing pod first crashes into water, the water forms a dense aqueous border to the screen space that seems to situate us amongst the liquid. Soon after, when Stone is submerged within the water, there is a thick, material quality to the screen space that seems to stretch into the auditorium. My first thought after watching the film was that Gravity is a good film but it’s not the best 3D that I’ve seen (not as visually interesting as TT3D (2011) or Dredd 3D (2012) for example) nor is it the best film that I have seen this year. After pondering on it some more, I feel that it will have an important place to play in the critical acceptance of 3D cinema and that it does have some stunning vistas. However the constant upwards build of anxiety situations for Stone will likely look dated and silly in the near future. During the screening that I attended, the audience broke out into laughter when Stone was faced with underwater reeds after finally breaking free from her space suit. This was a sign that the film hadn’t managed to captivate its audience as fully as it had intended. The music was also useful in building tension but it often felt overdramatic and likely to date quickly as well. Although I understand that the music had to play an emphatic role because the film was faithful to the rationale that there is no noise in space, a more daring film might have left the silence speak for itself. 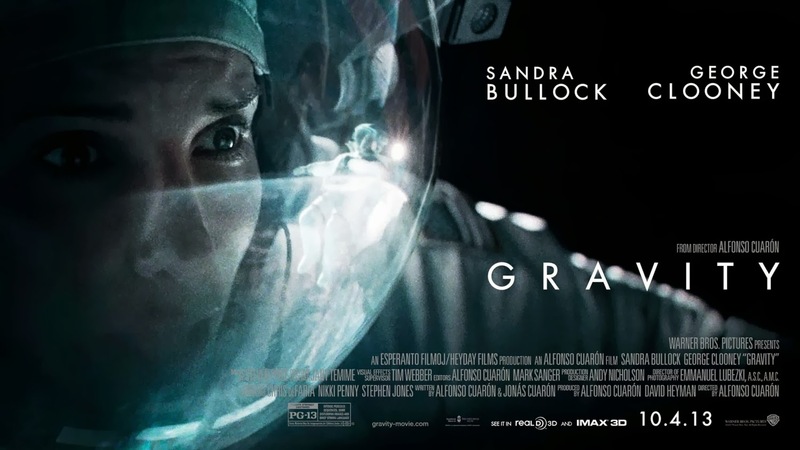 This doesn’t meant that Gravity won’t be an important film for 2013 and for the development of 3D cinema but it’s not going to be on my list of favourite 3D films.